The Australian Cattle Dog has changed little since the late 1800’s when the first standard was drawn up. In 1897 Robert Kaleski drew up the first Standard of points for the Australian Cattle Dog which was recognized by the original Kennel Club of New South Wales in 1903. This standard was not changed until 1963 and then changes were made in the early 80’s. The current standard has been in place since 1994. AKC has adopted the country of origin standard. CKC do have slight variations and some disqualifications. The general appearance is that of a strong compact, symmetrically built working dog with the ability and willingness to carry out his allotted task however arduous. Its combination of substance, power, balance and hard muscular condition must convey the impression of great agility, strength and endurance.. Any tendency to grossness or weediness is a serious fault. The Australian Cattle Dog comes from a spitz type breed, the Dingo, and should display all spitz characteristics except for the tail curling over the back. The head is wedge shaped, the eyes are oval, slightly obliquely set, the ears are small and pricked, there is a slight ruff around the neck. These are all spitz characteristics. Medium length neck blending into well laid shoulders. The topline is level, the angles are moderate. Balanced and symmetrical, sturdy and compact. The breed is generic with the key word being everything in moderation. The dog must fill the eye as a whole. No point should be so much in excess of the others as to destroy the general symmetry. Coarse or fine boned specimens should be penalised. In 1893 Kaleski described the breed as a “small thick set Dingo”, that has a head that is broad between the ears. This ensures that the dog has a large brain-box, hence has plenty of intelligence. If narrow here, the brain must be small and the intelligence feeble, hence a poor worker. As the name implies, the dogs prime function, and one which he has no peer, is the control and movement of cattle in both wide open and confined areas. Always alert, extremely intelligent, watchful, courageous and trustworthy, with an implicit devotion to duty making it an ideal working dog. The Australian Cattle Dog should always portray a picture of an intelligent, watchful, loyal dog ready at any time to defend master and property. He must clearly convey the ability to work. A soft dog that is out of condition should be penalized heavily. They are athletes and must be kept in good hard working condition even in the show ring. As a conformation show dog the breed has in recent years become particularly competitive with many excellent specimens gaining the ultimate Best in Show award. The Australian Cattle Dog can been seen in show rings all over the world. There are many specimens being exhibited in the United States, Canada, Europe, South America, Japan, Asia, United Kingdom, New Caledonia and more recently their popularity as a show dog, working dog and companion has reached South Africa, Kenya, India and some of the more remote parts of the world. The Obedience Dog is an area that the Australian Cattle Dog excels. This breed has a natural affinity for obedience work. Herding breeds in general with generations of experience in following the master’s hand signals when moving stock are a far better bet at obedience work than perhaps a Terrier that was bred to work on it’s own, killing rats in the farm shed. The breed is very quick to learn and responds immediately to the master’s signals and voice commands. They particularly enjoy Agility which is not only fun but often has breath holding excitement for both the handler, dog and spectators alike. The best part of all is the dogs love it. The Working Dog. 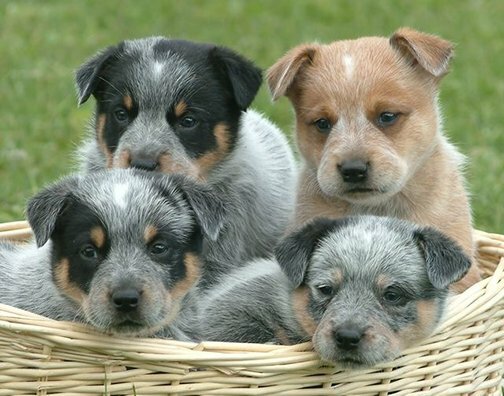 This breed was initially bred to work but over the years with the introduction of motor bikes and helicopters to herd the cattle long distances, the work of the Australian Cattle Dog in most part is confined to the yards. Although in some areas of Australia where the dense scrub is still impenetrable to a man on horseback and the modern stockman with their helicopters and motor bikes cannot get cattle out, the working cattle dog is sent in to bring out the beasts to the drovers. There is nothing more enjoyable than to watch this breed doing what they were bred for. The Cattle Dog’s loyalty and protective instincts make it a self appointed guardian to the stockman, his herd, and his property. Whilst naturally suspicious of strangers, must be amenable to handling, particularly in the show ring. Any feature of temperament or structure foreign to a working dog must be regarded as a serious fault. A nervous, shy or aggressive dog should be heavily penalized. The Cattle Dog should present as a bright, intelligent dog, loyal and ready to defend his master and property but at all times amenable to discipline. The characteristic “suspicious glint” should convey a strong alpha temperament and a “don’t fuss with me or my master” attitude. However, bad show ring behaviour is inexcusable. The head is strong and must be in balance with other proportions of the dog and in keeping with its general conformation. The broad skull is slightly curved between the ears, flattening to a slight but definite stop. The cheeks are muscular, neither coarse nor prominent with the underjaw strong, deep and well developed. The foreface is broad and well filled in under the eyes, tapering gradually to form a medium length, deep powerful muzzle with the skull and muzzle on parallel planes. The lips are tight and clean. Nose black. The head must be balanced, wedge shaped with a broad skull and muscular The breadth between the ears should be approximately 1/4 of the dog’s overall height. The head should be in three equal parts. The muzzle from tip of nose to stop is one part, the stop to the occiput is one part and the ear from base to tip is one part. From tip of erect ear to erect ear should be 2 parts. You are not looking for an equilateral triangle but a clean wedge measuring1.5 to 1. The skull and muzzle must be on parallel planes. The stop is not 90 degrees but a slight break between the eyes. When observing the head from the front, there should be no falling away under the eye, or big heavy cheeks. You should see a clean wedge. Far to often one hears breeders and judges refer to the ACD as “must have a big head”. This is incorrect. The standard calls for the head in balance with the dog, NOT a big head. Problems that are very evident are prominent stops, domed skulls, short muzzles, equilateral triangle shaped heads, boxed heads and heads that are too small or too large in proportion to the dog. “Kaleski writes”. The head must taper to a point at muzzle meaning that the least weight is at the business end, ensuring that the dog can get his bite in quickly and drop out of danger, on the same principle as the boxer using light gloves instead of heavy ones – his hitting is much quicker. He must be full under the eye, ensuring that the muscles which move the lower jaw are very strong, which is very necessary, as they correspond to the biceps of a boxer and give the dog power to do his work. A dog deficient there cannot continue biting long; his jaw muscles become tired. Strong and muscular in the jaws is vital for if there is a deficiency here, when a shod horse kicks a dog he has his jaw broken because there is no cushion of muscle to protect the bone; hence, if injured, he is useless. As the standard states the eyes must be oval in shape and placed well apart. They are slightly obliquely set. They are medium size and must be dark brown in colour with a warning or suspicious glint. Light coloured eyes should be penalised as this gives the dog a foreign often evil expression. Far to often, one sees domed skulls with round protruding frontally placed eyes and muzzles that are too short. http://www.judgesl.com/aucadog/heads.html (Picture # 10) Round protruding eyes would be a hindrance to the dog whilst working as the eye would collect dirt and foreign objects. Domed skulls are an obvious problem as the dog would encounter a swift kick directly to the forehead rather than the kick going over the head. The ears should be of moderate size, preferably small rather than large, broad at base, muscular, pricked and moderately pointed neither spoon nor bat eared. The ears are set wide apart on the skull, inclining outwards, sensitive in their use and pricked when alert, the leather should be thick in texture and the inside of the ear fairly well furnished with hair. The standard calls for preferably smaller rather than larger which means that if the ears are anything more than moderate size, it is better that they are smaller, as large ears are not characteristic of this breed. There is a tendency to have ears too big, incorrectly placed and of poor leather quality. So how big is too big? Pull the ear to the eye. A small ear will come close to the outer edge, a big ear will exceed the inner edge. Incorrectly placed? The outer edge of the ear must be on the vertical. Poor leather quality soft, weak, fly away ears, often with a crease in the ear. Kaleski writes, The ears are short, so that they can be readily laid flat when biting or fighting; and are less likely to be damaged. Pricked, so as to catch sounds, such as whistles or words of command, best, especially from a distance. Running to a tip, V- or diamond-shaped, for two reasons: (1) the progeny are more likely to be prick-eared, the ear-muscles rising much higher in a diamond-ear than a “tulip” or spoon-shaped ear; (2) the spoon-ear is a sure indication of the Bull-terrier cross; set wide apart on the skull, so that the ear inclines outwards rather than forwards, for in the latter case they do not hear so well; hence cannot answer to the whistle or word of command as efficiently from a distance. They should be as pricked as a cat’s for this reason. The teeth sound, strong and evenly spaced, gripping with a scissor-bite the lower incisors close behind and just touching the upper. As the dog is required to move difficult cattle by heeling or biting, teeth, which are, sound and strong are very important. An older dog with worn teeth should not be heavily penalised, but any dog that did not have a correct scissor bite would indicate lack of strength as a biter. It is not a requirement of the breed to have 42 well placed teeth, however the standard calls for teeth evenly spaced therefore no gaps and with 2 of the original breeds that make up the Australian Cattle Dog commonly plagued with missing teeth it would be difficult to expect full dentition, therefore, an obviously superior specimen should never be penalised for a SMALL number (I believe more than 4 missing should be penalised) of missing teeth. The neck is extremely strong, powerful, muscular, and of medium length broadening to blend into the body and free from throatiness. In male dogs it is common to see heavier coat on the neck resembling a ruff. The shoulders are strong, sloping, muscular and well angulated to the upper arm and should not be too closely set at the point of the withers. The forelegs have strong, round bone, extending to the feet and should show flexibility with a slight angle to the forearm when viewed from the side. Although the shoulders are muscular and the bone is strong, loaded shoulders and heavy fronts will hamper correct movement and limit working ability. The requirement is for a hard working dog that needs to cover long distances and work many hours. The upper arm should join the shoulder blade as near to 90 degrees as possible. The forelegs when viewed from all angles should be muscular, clean and strong boned. When viewed from the side there should be a slight angle of pastern which is necessary to absorb shock from the forequarters. Too much angle will result in loose weak wrists and too straight in pastern will cause jarring which puts a strain on the entire front assembly. Under hard work these poor fronts will break down. There is a great tendency to see a large number of short upper arms, which does not allow for the correct extension required. From the wither to the point of elbow should be equal to point of elbow to the ground. This is a problem area where the chest is either too shallow or extends past the point of elbow or the foreleg from the elbow to ground is too short. All these hinder correct, free, supple movement. Kaleski writes. “The shoulders are strong and well sloped, so that the dog gallops easily and drops with ease when biting. Chest is deep because a shallow-chested dog has no heartroom and is easily thrown off balance. If too deep, or “Bulldoggy” he cannot travel at any speed but it must not be out of proportion to the body”. The hindquarters are broad, strong and muscular. The croup is rather long and sloping, thighs long, broad and well developed, the stifles well turned and the hocks well let down. When viewed from behind, the hind legs, from the hock to the feet, are straight and placed parallel, neither close nor to far apart. The standard calls for strength and illustrates the need for powerful, muscular hindquarters to match the strong front. The hindquarters are the driving force of the dog, and weak, narrow or tapering hindquarters would not provide the strength required for the dog to work the long hours necessary when driving cattle. The most common problem in the hindquarter would be the insufficient turn of stifle. The standard calls for well turned stifle but we do not want the angulation of a German Shepherd. Remember the Australian Cattle Dog is moderate in every respect. We can not therefore excuse the many straight stifles that are being exhibited today which unfortunately leads to higher than required tail sets and incorrect angle of the croup. This will cause lack of drive and stilted rear movement. The length of hock should be approximately 1/3 the height of the dog, for preference the shorter the better. Kaleski writes, “The hindquarters are strong and muscular because they are the “engine” or propelling power of the dog. Some dogs are perfect in front but fail lamentably here; such dogs tire very quickly, and do not earn their salt for a drover. Back thighs well let down for speed, because the lower the hockjoint the longer the stride; hence more speed. No dew-claws on feet, because they catch in the long grass or mud and tear the sinew, crippling the dog. Good loins, for the reason that they are the hinge of the body, and if weak the body is useless. The loin should arch slightly, for the reason that the dog’s hindquarters are then of the Greyhound shape, giving him more speed and activity than a straight-backed dog”. The action is true, free, supple and tireless and the movement of the shoulders and forelegs is in unison with the powerful trust of the hindquarters. The capability of quick and sudden movement is essential. Soundness is of paramount importance and stiltedness, loaded or slack shoulders, straight shoulder placement, weakness at elbows, pasterns or feet, straight stifles, cow or bow hocks, must be regarded as serious faults. When trotting the feet tend to come closer together at ground level as speed increases, but when the dog comes to rest he should stand four square. Correct ground covering movement is vitally important in a working dog. Only a well constructed dog is going to move correctly. Gait in itself is not soundness, but a measure of soundness and correct gait is not possible without correct construction. The dog will converge to the centre line at faster paces, but they do not single track. The feet should be round and the toes short, strong well arched and held close together. The pads are hard and deep, and the nails must be short and strong. "No feet, no working dog". Kaleski writes: feet are small and shaped like those of a cat, because offering the smallest bearing surface for heatblisters on hot roads, or thorns ("bindii"); also when the foot is small the power is more concentrated giving better results. The shape of the foot was a disputed point for some years. Some breeders arguing that the dog with the splay or "hare" foot 'sank less in soft ground' have a greater bearing surface. However, experience has proved that the cat foot is the best all round. The set on of tail is moderately low, following the contours of the sloping croup and of length to reach approximately to the hock. At rest it should hang in a very slight curve. During movement or excitement the tail may be raised, but under no circumstances should any part of the tail be carried past the vertical line drawn through the root. The tail should carry a good brush. The tail should flow as part of the dog. It acts as a rudder for the dog in movement. All to often one sees a tail carried over the back like an antenna. The tail and croup go together. The flatter the croup and higher the tailset. More often than not this is also associated with straight stifle. The tail should never hook or curl and should never come up over the back. Kaleski writes. “Tail is of fair length, for the reason that it regulates the dog’s movements, being merely a continuation of the backbone covered with hair, and it serves to balance the dog in his gallop. If too short or too long, his speed and action suffer accordingly, just as with Greyhounds. Dingo, or bottle-shape, for two reasons: (I) this shape of tail indicates Dingo strain, as against a long, thin tail denoting Bullterrier, or a short tail the old Bob-tail: (2) a dog with a brush tail rests better than any other, as in a wild state the dog sleeps coiled in a circle, with the nose buried in the fur of the brush. I don’t know why exactly, but believe that there is a physiological reason for it. Probably, by lessening the respiration in this way, the dog conserves energy on the same idea as hibernation – otherwise suspended animation”.The coat is smooth, a double coat with a short dense undercoat. The outer-coat is close, each hair straight, hard and lying flat, so that it is rain-resisting. Under the body, to behind the legs, the coat is longer and forms near the thigh a mild form of breeching. On the head (including the inside of the ears), to the front of the legs and feet, the hair is short. Along the neck it is longer and thicker. A coat either too long or too short is a fault. As an average, the hairs on the body should be from 2.5 to 4 cms. (approx. 1-1 1/2 ins) in length. The breed is required to work in all weather conditions therefore they must have adequate protection against the elements. The coat is a double coat with the outer coat approximately 1 – 1.5 inches in length, straight and the undercoat is softer and shorter to keep the dog warm in winter and cool in summer. The coat should be moderately hard to the touch and close knit. Curly or wavy coats are sometimes evident in older dogs, but should be penalised in a young dog. Also open coats with little undercoat are seen, this should also be penalised as it would lack the required weather resistance. There is only one correct coat length as describes above but you do see the occasional close coat that has almost no undercoat. Also you sometimes come across a coat that has a longer outer coat that is soft, silky and open and tends to give the appearance of being standoffish with a soft woolly undercoat coming through the outer coat. This is also incorrect. Kaleski writes “The coat must be short, smooth and very dense, as the cattle dog has to work in all climates and all weathers. Like the Dingo, the coat consists of two – a loose outer one to turn the sun’s rays, and a short inner one, close and fine as a seal’s fur, to keep out cold and wet”. Kaleski writes “Colour, for two reasons: (1) That true blue colour ( neither light nor dark) is the most invisible colour possible particularly at night; hence a dog of this colour is not easily seen by cattle or horses, and thus has the least chance of being kicked. (20 the markings and colours as indicated stand for purity of breeding. In every strain of blue cattle dog there is some peculiarity, and it shows in the colour as well as in the shape, so that an expert can tell by looking at any blue dog how he has been bred. Some breeds have objectionable traits in their strains (Bull Terrier cross etc) and the colour helps as a guide to pedigree. If the dog shows more black than specified, he is probably a Barb Cross and hence timid and unreliable. If he is whitey-blue in colour he shows Dalmatian cross and is very likely to be kicked or gored, especially at night as stock can watch him much better; also he is more liable to go blind and deaf”. Any departure from the foregoing points should be considered a fault and the seriousness with which the fault should be regarded should be in exact proportion to its degree. Male animals should have two apparently normal testicles fully descended into the scrotum. Faults are common in all breeds of dogs, and without them most of the challenge would go out of breeding. It is important however to be aware of the faults of your dogs and try to overcome them. Faults are only an obstacle in our attempt to breed the perfect dog. Chest too deep, extending to below the elbow. Unsoundness, especially stilted, loaded or slack shoulders, heavy fronts, straight shoulder placement, weak elbows, pasterns or feet. Tail carried past the vertical line drawn through the root. Length of head from tip of ear to nose is 1.5 from tip of ear to tip of ear is 1. Breadth between the ears should be ¼ of the height of the dog. As with all other herding dogs, there are certain basic features about the Cattle Dog a judge must keep in mind at all times. In looking for the correct breed type with strength and substance the judge must be careful not to be misled by dogs which have been fattened up to give impression of substance. The standard calls for “hard muscular condition” and a dog capable of quick and sudden movement. Therefore, fat dogs with clumsy, sluggish movement must be penalised. Although this breed is renowned for its strength and strong alpha temperament, judges should not tolerate unreliable behaviour in the show ring. If the dog has the intelligence and temperament required, he should respond to the control of the handler and be tractable at all times whilst the judge is examining him. The head must clearly reflect the dog’s intelligence and his ability to move cattle with the power of his jaws. It is this ability to nip which enables him to shift a stubborn beast, therefore strength of jaw and moderate size wedge shaped head with parallel planes and slight stop is required. The expression is can only be described as hard and strong with a look that tells strangers clearly to beware. It is probably in this expression above any other feature that his Dingo ancestry is demonstrated. The neck as discussed earlier should blend into well angled shoulders, the chest is moderately broad and ribs well sprung, which gives the cattle dog a much rounder chest and body than we find in the GSD. With his strong hindquarters, well sprung ribs, broad loins, level topline and well turned stifle with short hocks he should present a picture of compact, muscular power. Remember that the breed should have no exaggerations. Moderate and balanced. Although a slight spring of pastern is allowed, we find generally that the bone runs right down to the feet which are compact and strong. Colour is important and spelt out clearly in the standard. These colours are what sets this breed apart from any other. To clearly understand this breed one must make a detailed comparison between this breed and other breeds in the Herding Group. One example is to compared the ears of the cattle dog with that of the GSD or Corgi. There are many points of similarity but the main differences should be clear. The cattle dog ear is wider at the base and smaller in comparison to the size of the head. Soft ears have from time to time been a problem and normally associated with ears that are oversized. Remember the standard calls for smaller rather than large. Finally, where you are in doubt as to a decision between two dogs, move them around the ring once more and decide which is better fitted for the task of droving cattle. Soundness is paramount in this breed. The breed was developed to work cattle under Australian conditions and the dog best equipped for this task should be your winner. For more information please read my detailed online presentation to the International Judges List at www.judgesl.com/aucadog/homepage.html.